South Gloucestershire Dementia Action Alliance and South Gloucestershire Council work in partnership to make South Gloucestershire a better place to live for people with dementia and their carers. Businesses have a key role as employers and service providers to people with dementia. People with dementia may be working for you, or wanting to use your service. We can help you to operate better. Make your staff dementia aware. Creating a ‘dementia friendly generation’ is one of our key aims around raising awareness about dementia and reducing stigma. South Gloucestershire schools will be encouraged to include a dementia friendly curriculum. Information about how to help people with dementia and their carers. Community and faith groups have a key role in enabling people living with dementia to live well, and be respected in their community. “We had a Dementia Friend’s session in the branch. It came as a shock to realise that 1 in 3 people over 65 years will get some form of dementia. It was also a surprise to find that staff have family members who are affected by dementia as it is something they have not really discussed. 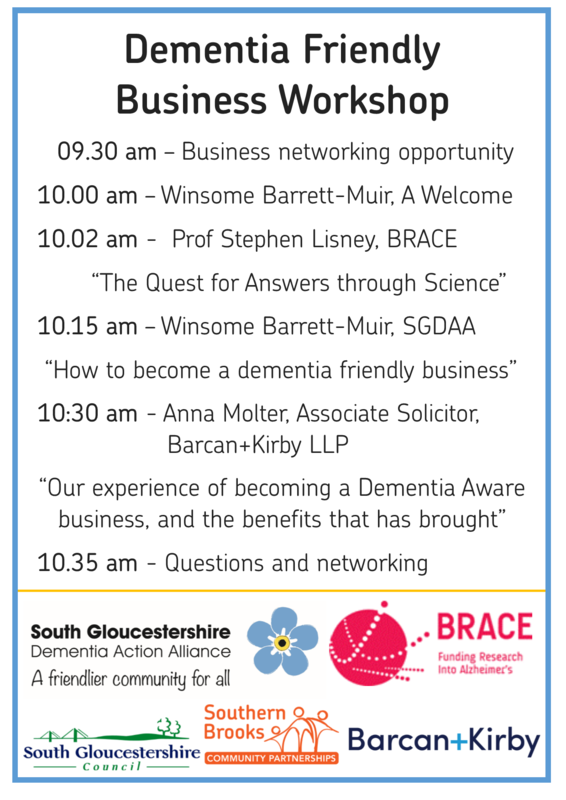 We are linking up with Brace to deliver a FREE workshop for Businesses in South Gloucestershire. People with dementia live in all our communities and they and their carers are very likely to be among your clients and customers. That’s why dementia is your business. By undertaking some simple actions, you can make their experience a better one and ensure that you are compliant with the Equality Act 2010. Through small, inexpensive changes you can make a big difference to your staff and customers alike. 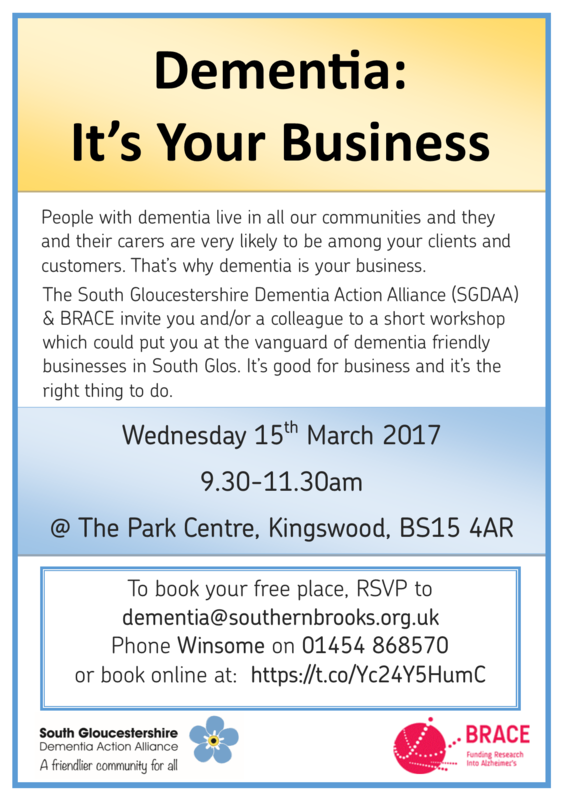 This short workshop could put you at the vanguard of Dementia Friendly businesses in South Gloucestershire. It’s good for business and it’s the right thing to do.